a 2.0L inline-4 cyclinder turbo engine and provide a standard all wheel drive system for maximum control and traction in uncertain driving conditions. The BMW X3 model excels in many important areas, however, as shown below. BMW X3 – Cargo Space: 28.7-62.7 cu. 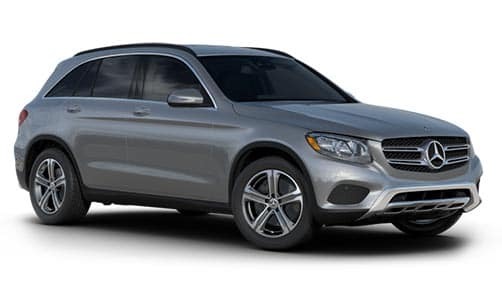 ft. of Cargo Space versus Mecedes-Benz GLC 300 4Matic 17.6 – 56.5 cu. 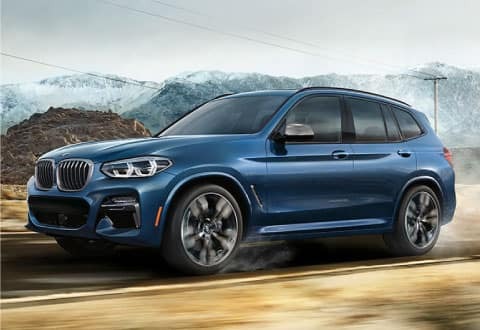 ft.
BMW X3 – Maintenance: Includes BMW Ultimate Care, 3 YR/36,000 MI factory-recommended maintenance*, versus the Mercedes-Benz offering of a pre-paid maintenance option at time of purchase. Overall, the 2018 BMW X3 xDrive30i offers additional available features, greater interior space, more power, and a more optimal covered maintenance plan than the 2018 Mercedes Benz GLC 300 4Matic, making the BMW X3 a smart choice over the competition. Contact BMW of San Francisco today to test drive the fully loaded 2018 BMW X3. The 2018 BMW X3 xDrive30i and the 2018 Audi Q5 Premium are among the favorites in luxury mid-size SUVs in the San Francisco bay area. Both of these fully equipped 5-seaters feature 2.0L 4-cylinder turbocharged engines delivering an EPA estimated 25 MPG Combined fuel efficiency. BMW X3 – Cargo Space: 28.7-62.7 cu. 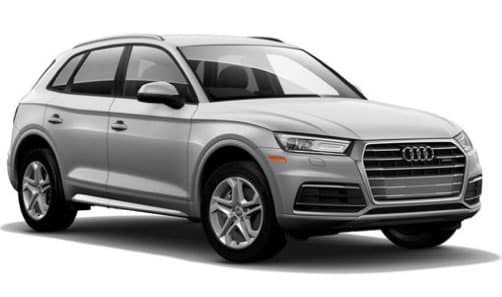 ft. of Cargo Space versus Audi Q5 Premium’s 26.8 – 60.4 cu. ft.
BMW X3 – Maintenance: Includes BMW Ultimate Care, 3 YR/36,000 MI factory-recommended maintenance*, versus the Audi’s 1 YR/10,000 MI no charge first scheduled maintenance. Overall, the 2018 BMW X3 xDrive30i pulls ahead of the Audi Q5 Premium with added available features, more cargo space, and a far more advantageous covered maintenance plan, making the BMW X3 the obvious choice and a smart buy. Interested? Explore the new BMW X3 today at BMW of San Francisco by submitting the form on this page or calling 800-872-2697. BMW X3 – Cargo Space: 28.7-62.7 cu. 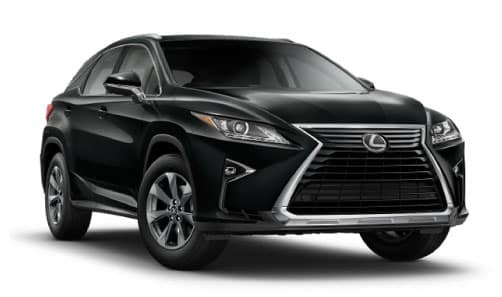 ft. of Cargo Space versus Lexus at 18.4-56.3 cu. 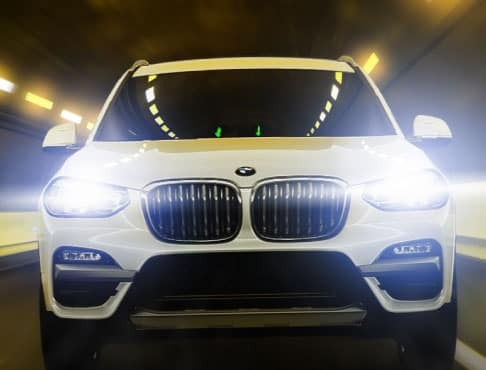 ft.
BMW X3 – Maintenance: Includes BMW Ultimate Care, 3 YR/36,000 MI factory-recommended maintenance*, versus the Lexus 6 MO/5,000 MI and 1 YR/10,000 MI no charge first and second scheduled maintenance. With better fuel efficiency, added cargo storage, and a more advantageous covered maintenance plan, all for a lower starting MSRP, the 2018 BMW X3 xDrive30i is clearly the smart choice in mid-size luxury SUVs.Want to learn more? Contact a 2018 BMW X3 expert at BMW of San Francisco today to experience all that the X3 has to offer first-hand. The New 2018 BMW X3. Sports Activity Vehicle®, Capable of More. Seize any reason for adventure – and accept no compromises along the way. The popular BMW X3 Sports Activity Vehicle® is reborn for 2018 in the all-new X3 xDrive30i and X3 M40i models, available now at BMW of San Francisco. Comfortable interiors, powerful engines, and intuitive controls come together in a vehicle where the passion for driving is more apparent than ever before. 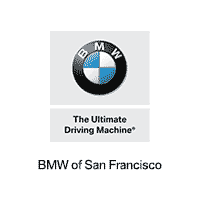 Simply submit the form on this page or call 800-872-2697 now to schedule your personal 2018 BMW X3 test drive today with your friendly BMW experts, BMW of San Francisco. Pack for any destination. Whether you are driving around San Francisco, or exploring across the country, the all-new BMW X3 can accommodate everything your adventure requires. With the X3 cargo versatility of its split fold-down rear seats, you reach an impressive 62.7 cubic feet of cargo storage space. And when you really need to haul, the X3’s optional factory-installed trailer hitch – the first ever available in a BMW SAV® – is ready for use with a broad range of BMW Accessories. The new BMW X3 at BMW of San Francisco offers a seamless interface with the optional iDrive 6.0 system. 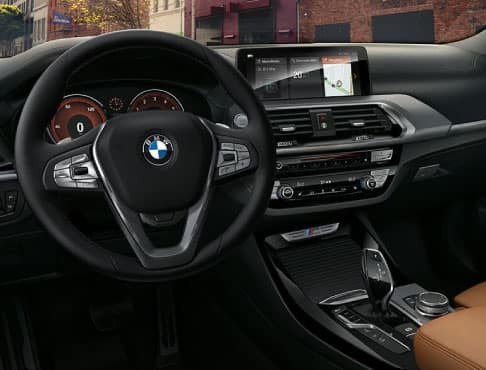 The X3 puts a driver’s world at your fingertips with the intuitive interface that responds to touch, Intelligent Voice Control, or optional Gesture Control. Essential driving information appears on the 8.8-inch instrument screen – or the 12.3-inch screen of the optional Dynamic Digital Instrument Cluster, available with the Executive Tier. Drive free and enjoy the Bay Area roads and California highways. Every all-new BMW X3 comes with an 8-speed Steptronic Sport Automatic Transmission with shift paddles, tuned specifically to match the BMW X3 engine’s performance characteristics. And with the X3’s xDrive as standard, BMW’s intelligent all-wheel-drive system, driving dynamism and efficiency is noticeably improved. Navigate your BMW X3 naturally around San Francisco and beyond. 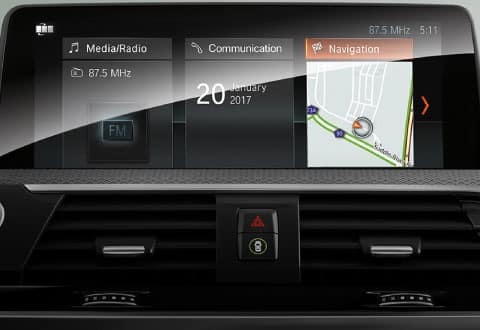 The intuitive interface of the latest iDrive includes natural language understanding, so you can simply say what you want to do – from finding a destination to choosing a radio station – and let your BMW do the rest. Demo the X3’s intuitive navigation system at BMW of San Francisco today. 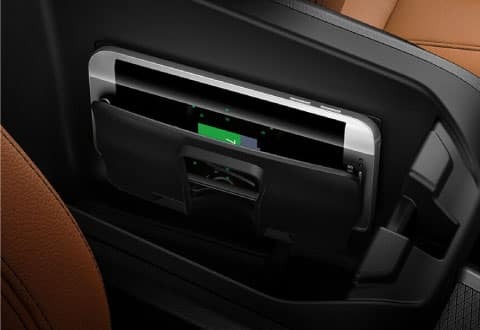 An optional charging pocket in the X3 central console provides inductive Wireless Charging for your compatible smartphone. The onboard WiFi Hotspot lets your passengers connect with ease – with 3GB of data included free for 3 months. View your X3 from every angle, from anywhere. 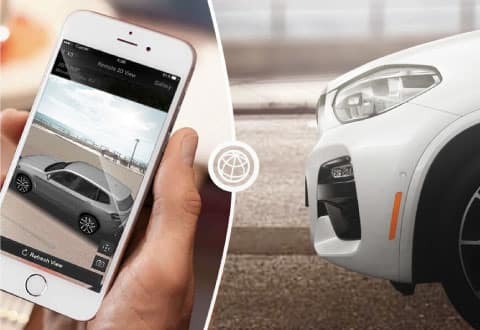 The optional 3D Surround View lets you view your vehicle remotely on the BMW Connected App, so you can make sure your BMW is in safe surroundings – and right where you left it. A simple motion is all it takes. The BMW X3 available Gesture Control lets you operate selected functions – from changing the volume to answering or rejecting phone calls and setting custom controls – totally touch free. 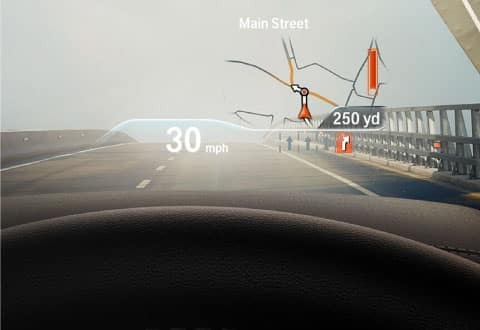 Get vital driving information – and see what’s coming – with the X3 optional Head-up Display. Navigation guidance, collision warnings, your speed and speed limits are projected directly on the windshield, so you can look ahead while keeping your eyes on the road. Pure enjoyment. Chase adventure around every San Francisco corner. 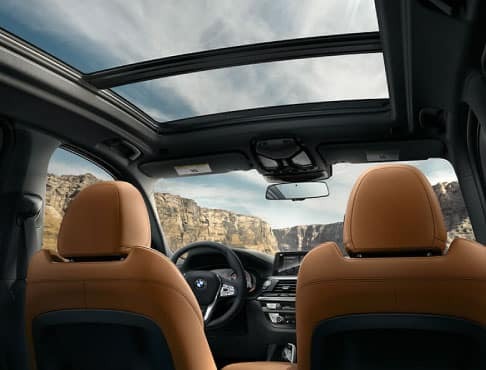 Standard BMW X3 features like the Sport leather steering wheel, Sport Automatic Transmission, and Sport seats let you live in the moment – and let nothing come between you and the road. Driver focused. Add an extra degree of ease to your busy day. The 2018 BMW X3 Comfort Access lets you lock, unlock, and open the doors and tailgate without fishing for your keys, while Adaptive LED Headlights intelligently light the way during after-dark drives. Find your path. The X3 full-color Head-up Display, only available with the Premium Tier, projects vital driving data right in your line of sight. 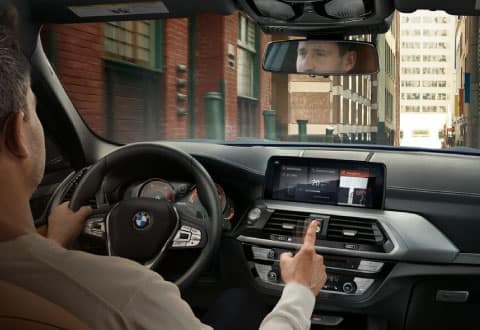 And the latest BMW Navigation system features auto-updating maps keep you on the right route, while Advanced Real-Time Traffic Information help avoid slowdowns. The BMW X3 offer Executive Tier — the ultimate expression. 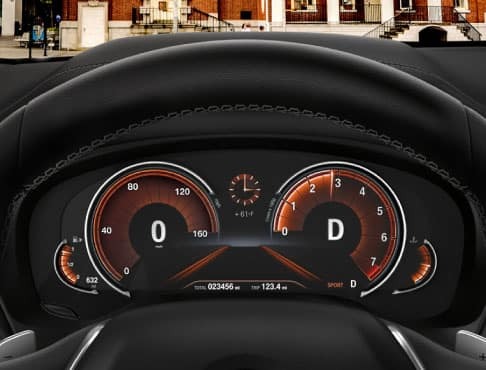 Command every aspect of your drive with the BMW Dynamic Digital Instrument Cluster and Gesture Control – and maneuver your X3 like a boss with Parking Assistant Plus, Active Park Distance Control, and Surround View with 3D View cameras. The X3 offers peace of mind on every drive. The BMW X3 Driving Assistance Plus Package includes Active Cruise Control with Stop & Go, to keep you moving on the busy California highways. You’ll also get the suite of features of Active Driving Assistant – including Blind Spot Detection, Frontal Collision Warning with City Collision Mitigation, the improved Active Lane Keeping Assistant, and more. EXPLORE THE NEW BMW X3 NOW! The new 2018 BMW X3 models are here in-stock at BMW of San Francisco and ready for your test drive! Simply submit the form on this page, or call 800-872-2697 to schedule your personal BMW X3 test drive experience now. All information presented on this page was obtained directly from BMWUSA.com and competing manufacturer web sites, in addition to national industry sites such as www.thecarconnection.com, and fueleconomy.gov. Information is deemed to be accurate but cannot be guaranteed. Consumers are welcome to independently verify all facts against manufacturer data and to contact us with any questions, using the form above. 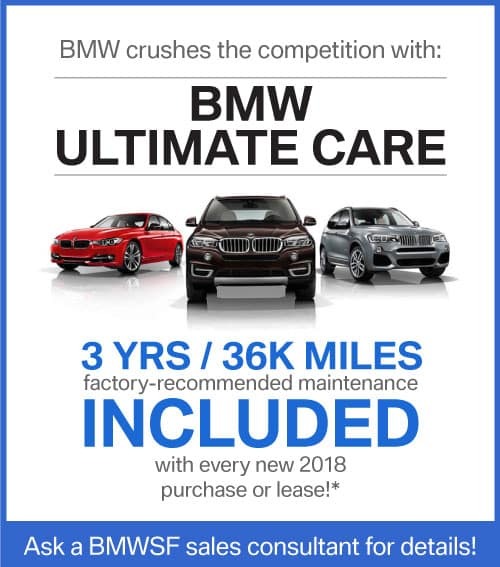 *All model year 2017 BMW vehicles and newer sold or leased by an authorized BMW center come with BMW Ultimate Care standard for the first 3 years or 36,000 miles whichever comes first. Only the following maintenance items are included with BMW Ultimate Care when they are performed as outlined in the vehicle’s Maintenance booklet:Engine Oil, Engine Filter, Brake Fluid, Cabin Micro Filter(s), Engine Air Filter(s), Spark Plugs, Remote Control/Key Battery, Vehicle Check, Fuel Filter (Diesel engines only). Details at https://www.bmwusa.com/explore/bmw-value/bmw-maintenance/terms-and-conditions.html. **QUALIFIED CUSTOMERS MUST LEASE OR FINANCE A MY2017 OR MY2018 BMW 5 SERIES, 7 SERIES, X3, X4, X5 & X6 THROUGH BMW FINANCIAL SERVICES NA, LLC BY NO LATER THAN APRIL 2, 2018. LEASE AND FINANCE CONTRACTS ARE SUBJECT TO CREDIT APPROVAL; NOT ALL CUSTOMERS WILL QUALIFY. OFFER APPLIES TO NO MORE THAN THE SCHEDULEDD MONTHLY PAYMENT(S), STATED ABOVE, THAT HAVE NOT BEEN PAID ON THE EXISTING CONTRACT AND MAY NOT BE USED TO PAY OFF AN EXISTING BMW LEASE OR RETAIL CONTRACT. SELLING DEALER IS RESPONSIBLE FOR MAKING REMAINING PAYMENT ON TRADED-IN VEHICLE. PLEASE BRING A COPY OF YOUR CURRENT COMPETITIVE LEASE OR FINANCE PAYMENT INVOICE SHOWING YOURACCOUNT NUMBER, PAYMENT AMOUNT AND CONTRACT END DATE. END OF TERMS CHARGES, INCLUDING BUT NOT LIMITED TO EXCESS WEAR AND TEAR, EXCESS MILEAGE, TAXES AND PAST-DUE PAYMENTS ARE THE RESPONSIBILITY OF THE ORIGINAL CUSTOMER. COMPETITIVE LEASE PAYMENT OFFER IS TRANSFERRABLE PENDING CREDIT REVIEW AND IS VALID THROUGH APRIL 2, 2018, AND MAY BE COMBINED WITH OTHER OFFERS UNLESS OTHERWISE STATED. OFFER IS TRANSFERABLE PENDING CREDIT APPROVAL, NONNEGOTIABLE AND NOT REDEEMABLE FOR CASH. SEE BMWSF FOR DETAILS. $1,000 CONQUEST ALLOWANCE PROGRAM: THIS $1,000 ALLOWANCE IS EXTENDED TO CURRENT OWNERS/LESSEES OF COMPETITIVE VEHICLES. THE ALLOWANCE IS NONNEGOTIABLE AND NOT REDEEMABLE FOR CASH. THE ALLOWANCE IS AVAILABLE ON THE PURCHASE, LEASE, OR FINANCE OF ANY NEW 2017 OR 2018 BMW X1 & X2 MODELS THROUGH BMW FINANCIAL SERVICES OR FOR CASH CUSTOMERS. LEASE AND FINANCE CONTRACTS ARE SUBJECT TO CREDIT APPROVAL; NOT ALL CUSTOMERS WILL QUALIFY. THE ALLOWANCE MAY BE COMBINED WITH OTHER OFFERS UNLESS OTHERWISE STATED. THE ALLOWANCE IS VALID AT PARTICIPATING BMW CENTERS TO ELIGIBLE, QUALIFIED CUSTOMERS. CREDIT AND ALLOWANCE ARE VALID THROUGH APRIL 2, 2018. OFFER NOT VALID TO CURRENT BMW CUSTOMERS TRADING IN A BMW VEHICLE. SEE BMWSF FOR DETAILS. 2 MSRP excludes destination & handling fee of $995, tax, title, license, and registration. 3 BMW AG preliminary test results. Actual acceleration results may vary, depending on specification of vehicle; road and environmental conditions; testing procedures and driving style. These results should be used for comparison only and verification should not be attempted on public roads. BMW urges you to obey all posted speed laws and always wear safety belts. 4 Qi wireless charging not compatible with all smartphones. Some devices may require a charging accessory.